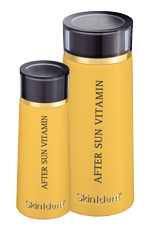 A soothing, calming lotion for the face and body -after Sun or Solarium. Supports the durability of the natural tan of every skin type. Reduces after sun redness, calms stressed skin and prevents premature aging of the skin. Apply immediately after sun or solarium exposure. Apply repeatedly until the skin irritation fades away.